Shakespeare Common Core Bell Ringers: Your First Five Minutes DONE! 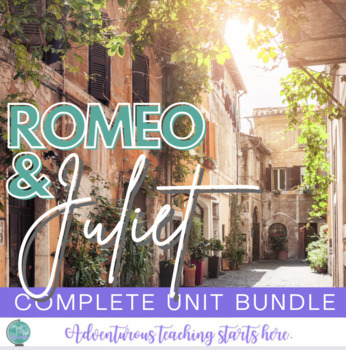 If you're getting ready to teach Romeo and Juliet for the first time or the hundredth time, it's always fun to shake up the way you introduce the play. I have five great activities to help create a more adventurous classroom approach to teaching the well-loved, classic Shakespearian play. 1) . Shakespeare Bell Ringers - use these to start each class period and get discussions going! 2) . True Love Synthesis Essay - before reading, have students examine TEN non-fiction articles that explore the reality of "true love". In this extended lesson, students will write an argumentative paper focusing on whether or not true love is fantasy or destiny. 3) Virtual Field Trip to London - Explore Shakespeare's hometown and the Globe theater with this fun, interactive class simulation experience. 4) .Prologue Stations - Give students the chance to explore the Prologue in a new way -- in stations! Students work through five different annotation stations to get a better handle on the start of the play. 5) Introduce Sonnets - through a hilarious poem "My Mistress' Eyes are Nothing Like the Sun" and an annotation checklist, students review and learn the different poetic components to a sonnet.